The regular visitors to the blog would have noticed that my outings have become few in number. I could make excuses like work keeps me busy, nothing interesting is happening anywhere in Delhi etc. But the truth is, I'd be lying. The fact is at 30, age seems to be catching up with me. I only attend events that excite me enough to push myself to leave the comfort of my home. 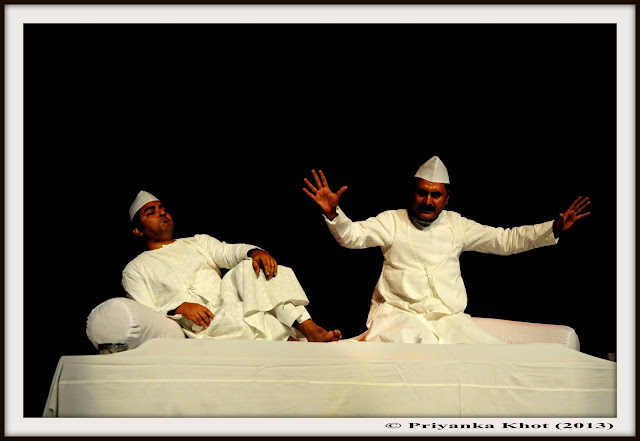 Fortunately for me, Team Dastangoi and India Habitat Centre (IHC) announced a show titled New Tales from the Tilism-e Hoshurba sometime in July. I stalked Facebook pages, Twitter handles and the IHC programme desk. I mailed friends, blabbered about the previous shows I had seen and almost feared that I had oversold the experience of dastangoi to friends who had never watched it before. After having very expensive and really awful tasting milk shakes, the six of us headed to our seats--first row, almost centre. I was very pleased. 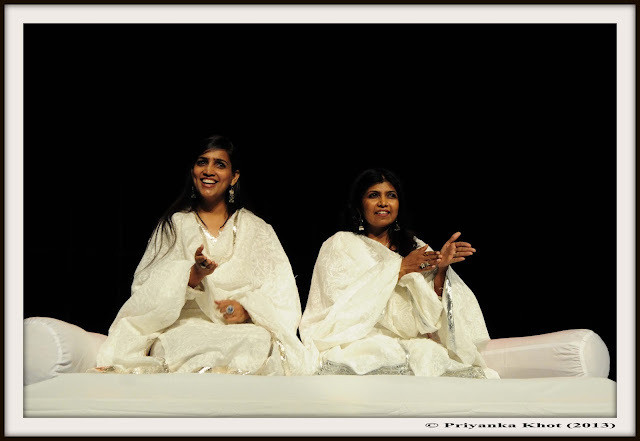 And then the magic began, Poonam Girdhani & Namita Singhai took the stage first. They looked beautiful in their silver and white attires. They sounded even better. Then came the masters themselves, Danish Husain and Mahmood Farooqui, and they transported the audience to a world of magic. Their words, expressions and actions ensured that every one in the hall sat mesmerised. I could not resist providing just a clip so that you could experience a little bit of magic. At the end of the evening, I was glad that I had not oversold the show to my friends. The six of us were smiling for a long, long time, happy that we had been under the spell of the dastangos for over two hours. Thanks for sharing this! Although I live far away, in Europe, stories of Tilism-e-Hoshruba have reached and enchanted me for all life! Nice post - Thanks. If you have recorded more of the event (and have permission), especially the two ladies, on YT, so we may be able to enjoy it.